The rugged yet sophisticated styling of the Jeep Cherokee exterior is just one thing that draws in the driver’s attention. It’s also about the sensors and cameras that make it safer to drive. 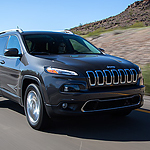 Ranked as one of the top SUVs for 2019, the Jeep Cherokee trims give you a lot of different options to think about, such as colors, body kits, grills, and wheels. Want to see all of the variations and even customize your own Jeep Cherokee? You can test drive all of the latest models on the lot at Allen Samuels CDJR of Oxford.